The wide open Waimakariri beaches fronting Pegasus Bay, might just be North Canterbury’s best kept secret. Canterbury’s continental climate has great extremes, from the sizzling 30 plus Centigrade temperatures of summer to the cold southerlies in winter. It’s great to find a sheltered place away from the dust, heat and wind when the famous Nor' Wester is blowing. Despite the close proximity of Christchurch and Waimakariri District’s population of 35,000 people, these days it is still possible to find yourself the sole occupant of a beach. Pegasus Bay has a smattering of baches in tiny beach settlements. Recreational fishermen can pretty much depend on taking home a feed of kahawai, skate, rig or fat paddle crabs. Crayfish can be caught free diving and mussels and paua can be gathered off inter-tidal rocks at the end of the beaches. You can really get back to nature here, tramping the coastal walkways and building campfires on the beach to sit around at night under a dazzling Milky Way. The Pegasus Bay Walkway links Kaiapoi with Kairaki Beach, then proceeds to Woodend Beach and runs behind the sand dunes to Waikuku Beach. It is well signposted and you can start at either end or at intermediate points along the 15km route. 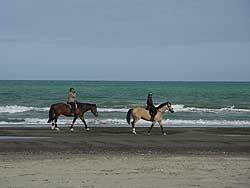 Karaki Beach is located at the Waimakariri River mouth, an area popular for fishing, particularly salmon fishing and whitebaiting in season, as well as sailing at the local club. Pines Beach is minutes from Kaiapoi and offers a large children’s playground as well as swimming, surfing, fishing and coastal walking. Woodend Beach has camping, picnicking and children’s playground facilities. The broad, flat beach is safe for swimming and has life saving patrols in summer. 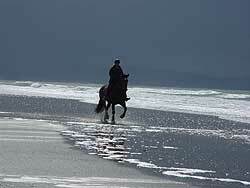 Waikuku Beach, at the northern extremity of the Waimakariri District, is an established settlement. The Ashley River estuary is the largest in Canterbury and is home to many migratory wading birds. The beach and river mouth is always popular for summer camping, fishing, picnics, surfing and swimming. The Kaiapohia Maori monument and nearby lavender farm are worth a visit.